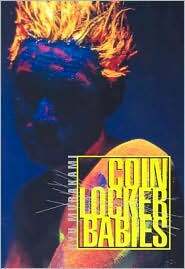 I’m guessing a lot of people wouldn’t make it past the first sentence of Ryu Murakami’s novel Coin Locker Babies. On the other hand, it serves as a sort of litmus test: if you can get past that sentence, you can get through the rest of it. The gouged eyeballs, exposed brains that look like tofu, and the part where a character takes a scissors to his own tongue. This novel is the anti-coming of age novel. It’s the story of Kiku and Hashi. Both were discovered stuffed into boxes and left for dead in coin lockers. They meet at an orphanage and forge a friendship through their shared survival. Kiku plays the role of fixer: he kicks some asses and becomes really good at the pole vault; Hashi is more timid. And when he leaves home to find his birth mother, he lands in an uninhabitable area in Tokyo called “Toxitown” where he sells his body to men, and eventually meets one who can help further his career as a singer. Chaos follows. Kiku ends up in jail, Hashi goes crazy. Kiku’s girlfriend Anemone watches a truck run over her pet alligator. Hashi decides he is straight. It’s all very complicated, and at parts becomes too much to handle. My favorite moments involve rice omelets, the favorite meal of both Kiku and Hashi: mix rice with ketchup and peas, put it in an omelet. And also descriptions of Hashi’s voice, which seeps into the core of the listener and brings back their most primal memories. He is able to manipulate emotions through his tunes. I love Ryu Murakami. In the days after reading In the Miso Soup, I missed the story. The entire world felt like those minutes after you take off your roller skates and still kind of feel like you’re skating, while you’re trying to adjust to normal, lackluster walking. I had read the book while I walked from here to there in the skyway downtown, and even now, when I’m walking that route it reminds me of the feeling of reading that book. I’m trying to think of something to compare Murakami’s work to, and the only thing I can think of in pop culture is the TV show “Nip/Tuck.” Graphic, barfing, seedy mattresses, unpredictable, stabbing, gory, and — surprisingly — funny. Murakami doesn’t blink when a character sticks a knife into his pregnant wife’s protruding belly. His characters have a sexual repertoire where missionary style doesn’t even register. And where a lesser writer wouldn’t be capable of writing a believable character with a pet alligator, he invents a model who’s entire apartment caters to the beast — humidifiers, tropical plants, raw meat dangling from a stick — and makes it less likely that she wouldn’t have a pet alligator. This book isn’t as great as In the Miso Soup, but that is the fault of the length and the plot — which gets a little too WTF in the wrong kind of way. The writing remains stunningly descriptive and still made me want to barf. This is one of my favorite books! (Even loved the pet alligator!) I was so excited to see it reviewed, and it’s not the easiest book to review, by any means. There is something incredibly captivating about Murakami’s writing that makes it hard to put down even in the most twisted and disturbing parts. Great job! !